Nana Mack cooks & crafts. Grandpa does the heavy lifting. I’ve been nursing a sore wrist all week. I believe I slept on it, then typed and typed at work, and stressed it even more. Wah cry. So sewing was hard this week. When I was learning to play guitar, my instructor told me to try and avoid or fix anything painful because you don’t want to associate you beloved hobby with pain. It will make you dread something you once loved. How true that is in many aspects of life. So I think a trip to the chiropractor or a brace is in order. 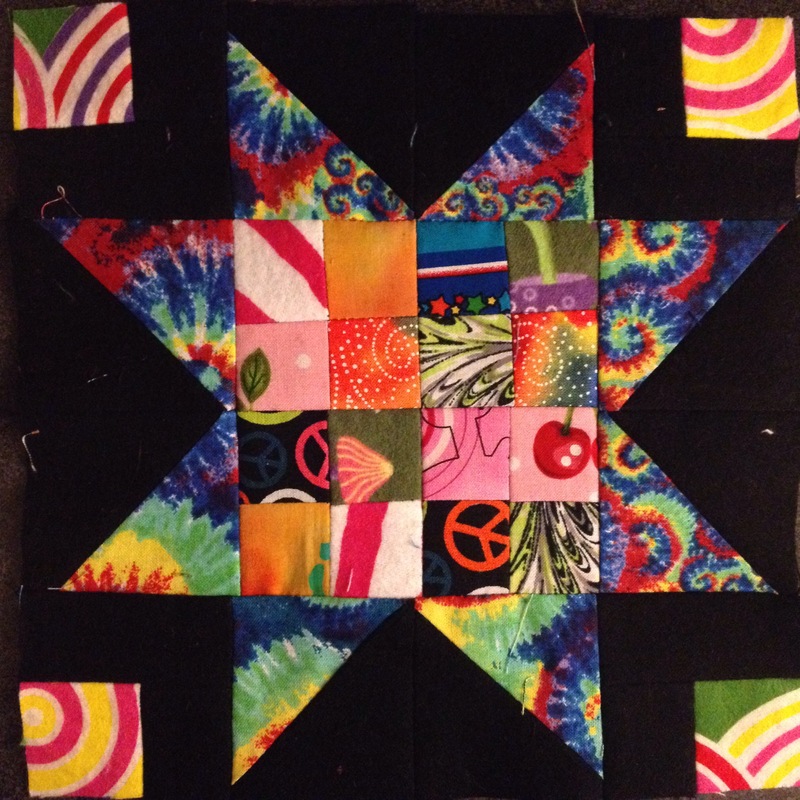 The first block I made this week is an 8″ 16 patch inside a morning star. I will give you both squares and HST measurements just incase you are more daring. I used squares and saved my excess instead of making HSTs. 1. Sew the background large squares (or HSTs) to the star points to make HST squares. 2. Sew the corner squares to the small background squares. 3. 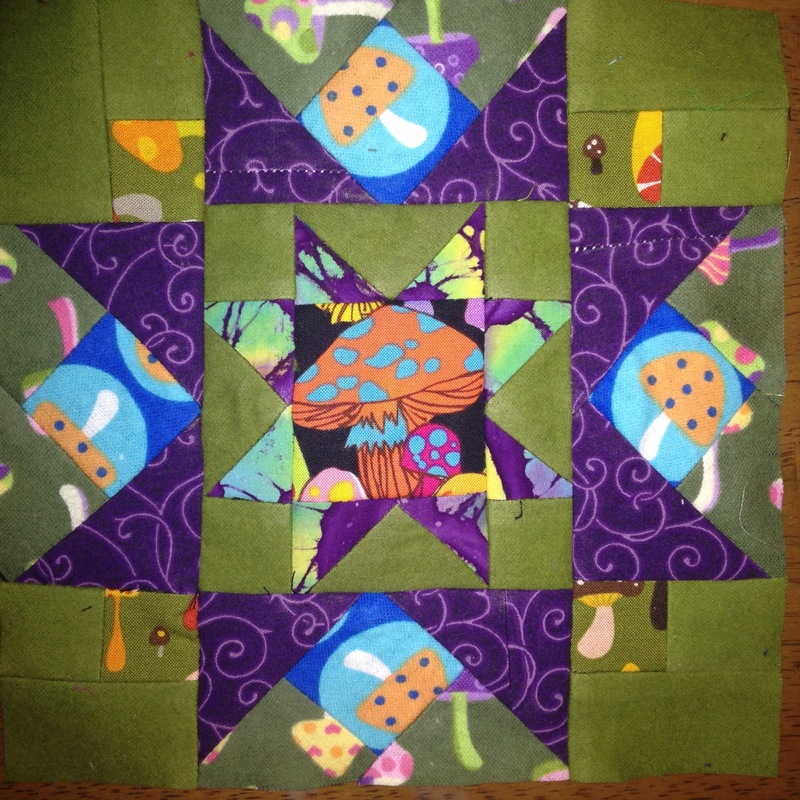 Sew the first round of the 16 patch squares by sewing one to one other for now. 4. Press this first round if chain sewing. 5. Sew two of step 1 together to make one side of the star’s points. Repeat until all 4 sides are made. Make sure they are rotated correctly to match the picture before sewing. 6. Sew step 2’s new rectangle to the background rectangle to make a square. Repeat for all four corners. 7. Sew one set of step 3 to another set to make a square. Repeat until you have your 4 squares of 4 squares! 8. Press this round if chain sewing. 9. Sew step 6 new square to the sides of step 5. Make sure that the corner colored square is in the top left on the left side, and opposite on the right side. See the picture for an example. Repeat once more. 10. 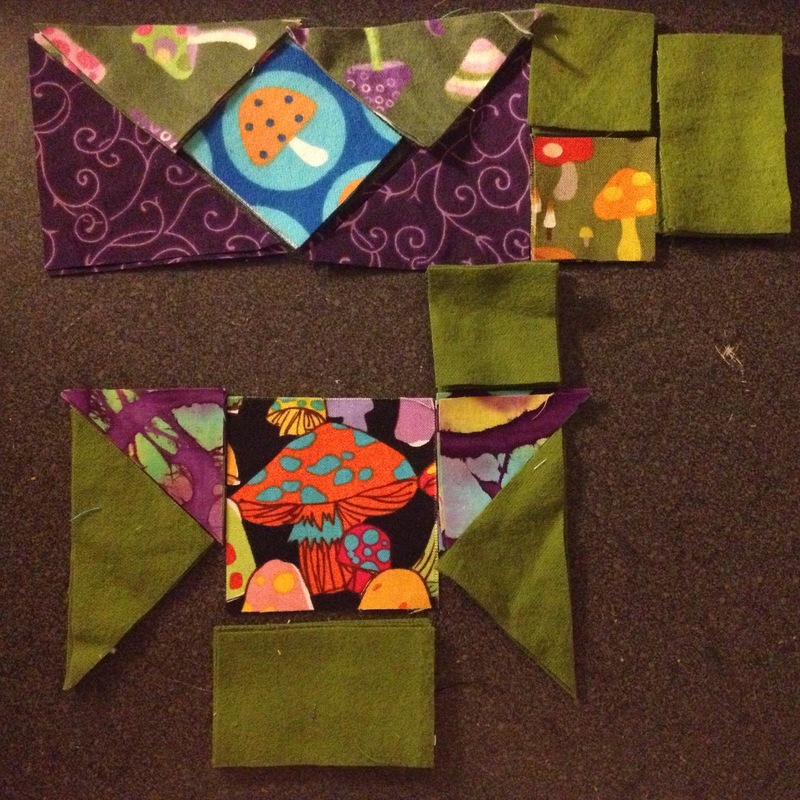 Sew one set of step 7 to another and repeat once more for two rectangles of 8 squares. 11. Press this round of chain sewing. 12. Sew the 8 patches together to make your square. Press. 13. Sew one set of star points to the left and right of the 16 patch. See the picture above for placement. Press. 14. Sew the three rows together to make the block. Once again, see the picture above for placement. Press. Always press! Such a beautiful way to use up tiny pieces of fabric! I have this awesome psychedelic mushroom fabric scrap left over from a project I had sewn 3 years ago that I have been patiently waiting to use. I only have a piece about 3″x6″ along with some other mushroom fabric scrap so it has been hard to find a block pattern worthy of using up the last of this amazing fabric. I finally decided on repeating the Evening Star – Morning Star variation from week 6. Unfortunately my wrist is still hurting so I only got to cutting it out and had to stop. I will post an update when it is done. I am sure this block will be worthy of such an awesome scrap! I just noticed that I did the same thing with the other Evening Star – Morning Star. I had a small piece of an alien cartoon fabric that I used on a project for my BF. Do you have a special scrap piece if fabric that you are holding into for a worthy block? Show me yours! Here is the finished block! Love the colors in that first pic. If your doll needs it, you can build it. Handmade Hemp Clothing with detailed applique designs!!! Unique and an earthy feel!! My take on customer service and work ethic! The story of the Macks working together to make their house into a home.